“I’m just looking for an option in limited cases that I would be able to have it not apply to certain people,” said Mayor Martin Walsh. Mayor Martin J. Walsh is seeking the authority to waive a longstanding rule requiring top municipal officials to live in Boston, a reversal of the mayor’s earlier position that is already sparking pockets of resistance on the City Council. The residency requirement has made it difficult to fill top positions in the new administration because family considerations prevented some qualified candidates from moving to the city, Walsh said in an interview. The administration filed a proposed ordinance Monday in the city clerk’s office that would give the mayor the power to waive the residency requirement for 75 to 100 department heads, Cabinet chiefs, and the mayor’s staff. The city’s residency law requires new hires and top city officials to live in Boston but allows a significant proportion of other municipal workers to live elsewhere. Under Walsh’s proposal, a request for a waiver would entail filing a letter with the city clerk stating the name, address, and position of the new hire. The mayor would not need approval by the city clerk or City Council to grant a waiver, according to the proposed ordinance. “If I use this, it’s not something I’m going to be using a lot,” Walsh said. 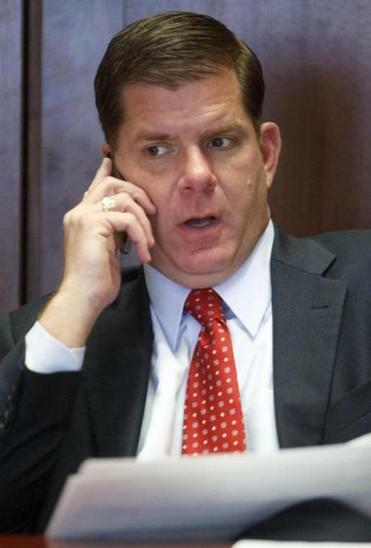 Some top administration officials live outside the city, and Walsh said at the time of their hiring that they needed to move to Boston within six months. On Monday, Walsh said he “potentially could” retroactively waive the residency requirement for people he has already hired. The mayor’s corporation counsel and close confidant, Eugene L. O’Flaherty, lives in Chelsea, although Walsh said O’Flaherty recently purchased a condominium in Charlestown. Another top aide, Joseph Rull, lives with his family in Norwell, and the city’s new chief financial officer, David Sweeney, lives with his family in Milton. Councilor Tito Jackson, who backed Walsh’s campaign last fall, said he was surprised by the mayor’s proposal and not inclined to support it. In April, Councilor Michael F. Flaherty Jr. filed a measure that would force applicants for Boston fire and police jobs to live in the city for at least three years before applying, an increase from the current one-year requirement. Despite describing himself as a “strong supporter of residency,” Flaherty said he was open to Walsh’s proposal, with limits. Critics have long argued that the residency requirement has made it harder for the city to attract top talent to key jobs. Samuel R. Tyler, president of the Boston Municipal Research Bureau, rejected the economic argument that a residency requirement was needed to keep the middle class. Unlike the urban flight of the 1970s, people are flocking to Boston today, he said. Boston instituted a residency requirement in 1976, but over the past four decades, the rule has been slowly diluted. Boston has a workforce of roughly 18,000 employees, and many are no longer required to live in the city. The School Department, for example, has 9,640 employees, but fewer than one-third are required to live in Boston, according to a department spokesman. Teachers, paraprofessionals, principals, headmasters, and others are exempt from the residency requirement, although the majority live in the city. Custodians and school police must live in Boston when they are hired, but like almost all union members working for the city, they can move to the suburbs after 10 years. Last year, one out of every three full-time city workers lived outside Boston, according to a Globe analysis of payroll data. Higher-paid municipal employees were more likely to move to the suburbs, with almost half of city workers who earned $100,000 living elsewhere. Boston had plenty of company when it imposed the residency rule. By 1980, nearly two-thirds of cities with populations over 250,000 had residency laws, according to the Walsh administration. In recent years, several states have prohibited the requirements, including Michigan, Ohio, and Minnesota. Some large cities, such as Boston and Chicago, have retained the requirements. The proposed ordinance will be taken up Wednesday by the City Council.